Before break, I did a week long money focus with my students. We focused mainly on identifying coins and their values and counting coins up to $1. Later in the year, we will focus on making change and incorporating dollars into their counting of money. 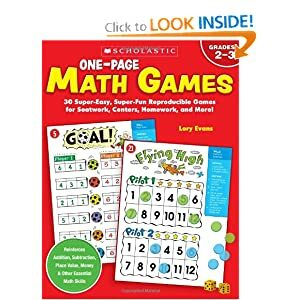 My district uses Investigations math and we played the game Collect 25¢ about a million times. We also played Collect 50¢ and for my higher kiddos, they played Collect a Dollar. 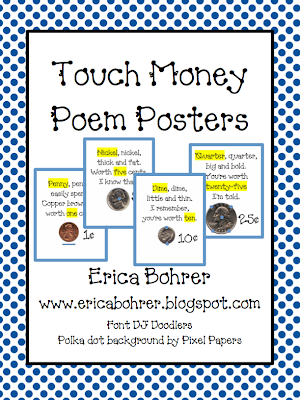 We also utilized Erica Bohrer's WONDERFUL Touch Money posters. What a wonderful resource! 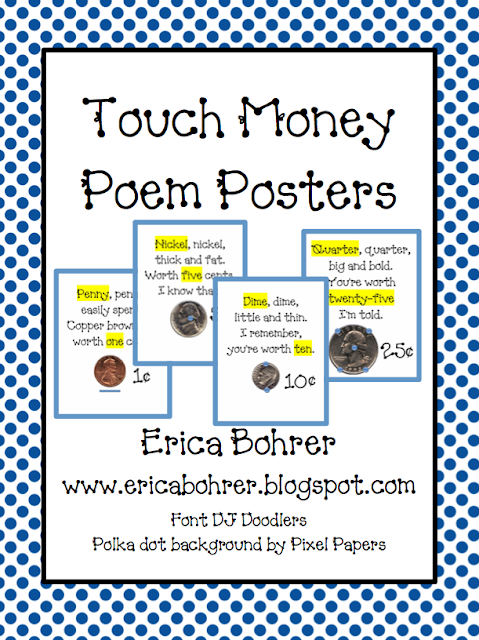 The concept of touch money really helped my struggling students and helped most of class counting amounts of coins over 70¢. Whenever I heard, "I don't get it!" I would reply, "Go use the touch money posters, and the "I don't get its" turned into "I got its." I love when that happens. I also hung up large pictures of the coins that showed the front and backs of the coins with the Touch Money dots on them in the front of the room, and my students really benefited from seeing the touch dots on the front and back of the coins. We also used several sheets from the following resource book. I am often indifferent with resource books that you can buy at the teacher store but I loved this book. I especially loved how the book builds with difficulty, making it easy to differentiate. During choice time, I would have the students work on some of these pages and hung up a key for them in the back of the room. I love doing this because students get to self check their work and you don't spend a lot of time going over work as a class, which can be beneficial but can also be spent doing other things. We also played several games from Lory Evans. One was a freebie from her blog. The other was from her Scholastic Book. I ordered my copy of her book from Scholastic with my bonus points and use it almost weekly. 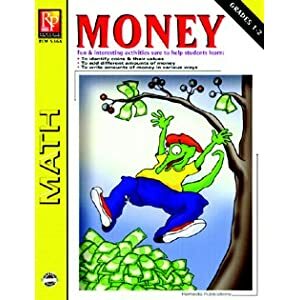 My students LOVED the game "Make a Dollar" from her book. I also used this Pinch and Total activity from What the Teacher Wants. I loved this activity because my students were able to move through the activity at their own pace and it made a great formative assessment as well. Win, win. One of our focus indicators for money is representing an amount of money multiple ways. I made the following flip books for my students to practice this skill. 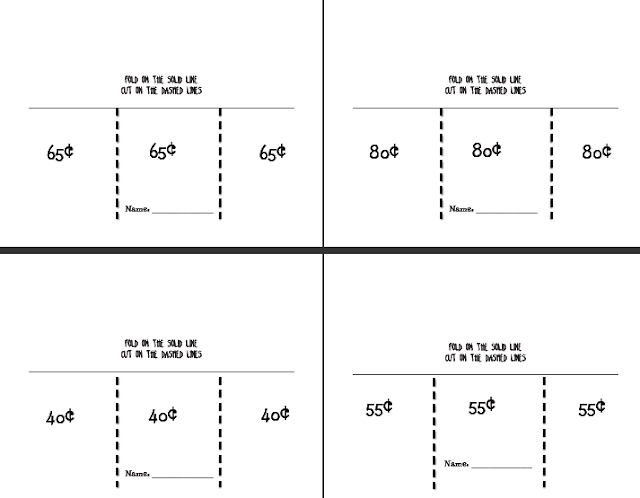 I had my students show three different ways to show the amounts on their flip books and then they switched with a partner. Their partner checked their coins and made sure their partner's coin drawings were accurate. If there were any disputes, I quickly jumped in to referee. My students loved these activities and I heard lots of good math discussions while they were reviewing each others work. Click on the preview below to download your own copy to use with your class. 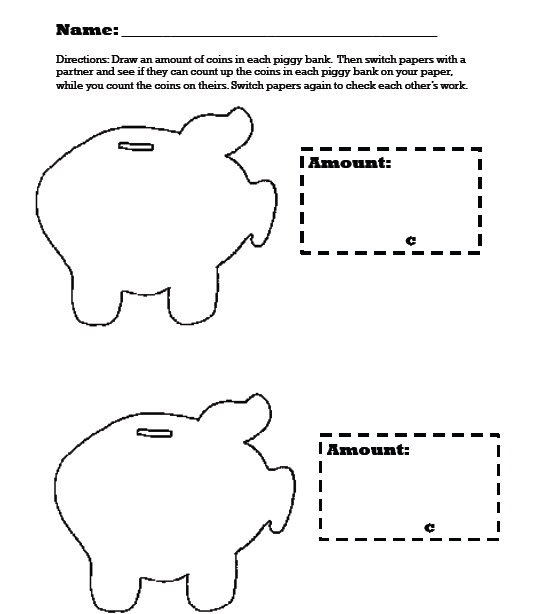 I did one flip book a day during the week we studied money. My students have really mastered the art of collaboration and partner work lately, so I wiped up this partner activity for them to use at the end of our unit. It was also a hit. Click on the preview below to get your own copy. Overall, I was so happy with our study of money and level of mastery my students achieved! 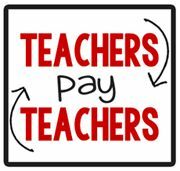 When I taught third grade, most of my students struggled to even identify coins and their values, making teaching making change and making money amounts using the least amount of coins possible, VERY difficult. So I wanted to make sure I gave my second graders a solid foundation on identifying and counting coins, as well as making sure they were able to show multiple ways to make a certain amount of money. Enjoy your weekend! :) Happy New Years! Hi Lisa! Thank you for sharing links to these great activities! 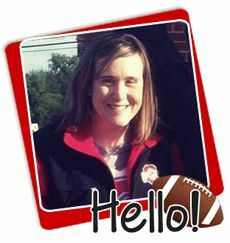 I am excited to be one of the first followers to your blog. 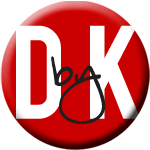 I would love for you to come visit my blog and grab LOTS of *freebies*! I do Touch Math and Touch Money with my kiddos and I love it! It is just another strategy that they can use if it works for them, and it has helped some of my struggling kiddos tremendously!! Ahhh! I'm glad you could use that game!!! 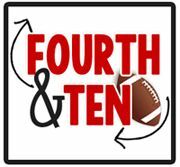 Thanks for the shout out! I do agree with all of the ideas you have offered to your post. They are very convincing and will definitely work. Nonetheless, the posts are too quick for newbies. May you please extend them a little from subsequent time? Thank you for the post.